50 Easy to Follow Guided Flows for You & your Little Yog! 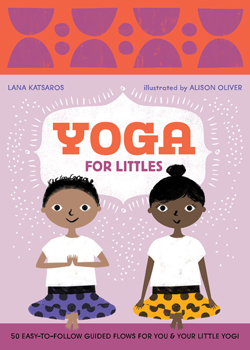 Yoga for Littles brings yoga, meditation, and movement into the home for children and families in a fun and playful way. Each card is designed to be engaging and just challenging enough to create a healthy daily habit of mindfulness and calm. Not only do the cards teach yoga poses, they also develop discipline, focus, balance, and wellness for both parents and their littles. The deck includes 50 stand-alone cards, each featuring one pose with an illustrated child on the front and instructions on the back. The deck also includes The deck also includes a fold-out piece with 50 uniquely customized flows for combining cards. You'll find flows to wake up, to calm down, to make a wish, to balance, to fight the fidgets, or to sleep tight. Plus, you and your child can create endless combinations of your own. It's never too early to introduce the benefits of yoga to children, and with Yoga for Littles, you can begin practicing with your little yogi right away.